Carlos Daniel Tocci…resides in his native Maracay, Venezuela…originally signed by Phillies as a non-drafted free agent on his 16th birthday: 8/23/11…signed by PHI scout Jesús Méndez. Was on the active roster all season aside from a DL stint 4/22-6/1 with a bruised left hip…rookie had 36 total starts (35 in CF, 1 in LF), ranking 2nd on club in starts in CF…batted .086 (3-35) with no XBH and one RBI in 27 G before the All-Star break, then hit .282/.303/.365/.668 (24-85) with all 5 XBH in the 2nd 'half'…the .282 BA was highest of any Ranger with 90+ PA's after the break…batted .353 (12-34) in final 17 G/11 GS beginning 8/17…ranked 8th in A.L. with 6 sac bunts… career-high 3 hits on 8/17 vs. LAA…1st RBI was 6/30 vs. CWS…recorded 1st hit on 4/8 vs. TOR…made ML debut in team's 3rd game on 3/31 vs. HOU…made 1st career mound appearance in 8th inning 7/23 vs. OAK, retiring both BF…was 13th position player in club history to pitch...batted .349/.414/.395/.809 (45-129) over 33 games with Aragua in the Venezuelan Winter League. 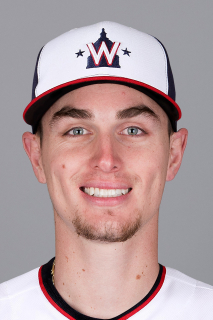 Combined to bat .294/.346/.381/.727 (142-483) with 3 HR and 52 RBI in 130 games with Reading (AA) and Lehigh Valley (AAA), his first action above A-ball…hit .307 (132-430) with a .760 OPS while spending the bulk of the season at Double-A, ranking among Eastern League leaders in average (2nd) and triples (T1st, 7)…selected a midseason All-Star, going 2-for-4 with a run scored for victorious East squad on 7/12 at New Hampshire…had a .992 (2 E/254 TC) fielding pct. in 108 G in the outfield with 6 OF assists…earned a late-season promotion to the IronPigs on 8/17…Lehigh Valley made the playoffs, with Tocci going 3-for-12 with a BB and RBI in 3 G…played for Tigres de Aragua in the Venezuelan Winter League, batting .314 (22-70) with 5 2B, 2 3B, and 5 RBI in 18 G, all in December. Spent entire season with Clearwater (High-A)… named a Florida State League midseason and postseason All-Star… Selected as Phillies Minor League Defender of the Month for May and Phillies Minor League Player of the Week, 6/20-26… led FSL in hits, ranked 3rd in AB, T5th in doubles and 10th in BA and TB (181)…had an 11-G hit streak, 6/14-27, and a 10-G hit streak, 7/9-21…recorded 38 multi-hit games, including 3 G with 4+hits with one 5-hit effort…was 19-for-56 (.339) with RISP and 2 outs…named Rookie of the Year in the VWL (.323 BA, 28 RBI, 40 R). Began season with Lakewood (A)…named a South Atlantic League midseason All-Star…Phillies Minor League Player of the Month for both April (20 G, .359 BA, 28-78, 12 R, 8 2B, HR, 9 BB, 7 SB) and July (28 G, .348 BA, 40-115, 15 R, 4 2B, HR, 6 RBI, 4 BB)…also named Phillies Minor League Player of the Week, 4/9-19…promoted to Clearwater, 6/16… batted .313 (47-150) in his first 37 G following his promotion… posted a .847 OPS in 11 G for Aragua in the VWL. Spent season with Lakewood…Phillies Minor League Player of the Week, 4/14-20…finished 4th in South Atlantic League in triples…hit his 1st professional HR, 7/16 at Hickory…following the season, named 8th-best prospect in Phillies minor league system by Baseball America. Spent season with Lakewood…following the season, named 6th-best prospect in Phillies minor league system by Baseball America…participated in Florida Instructional League. Began pro career with Gulf Coast League Phillies (R)…participated in Phillies Instructional League. March 15, 2019 Texas Rangers optioned CF Carlos Tocci to Nashville Sounds. November 20, 2018 CF Carlos Tocci assigned to Tigres de Aragua. June 2, 2018 Texas Rangers activated CF Carlos Tocci from the 10-day injured list. May 23, 2018 Texas Rangers sent CF Carlos Tocci on a rehab assignment to Round Rock Express. May 14, 2018 Texas Rangers sent CF Carlos Tocci on a rehab assignment to Frisco RoughRiders. December 14, 2017 Chicago White Sox claimed CF Carlos Tocci off waivers from Lehigh Valley IronPigs. December 14, 2017 Chicago White Sox traded CF Carlos Tocci to Texas Rangers for cash. November 26, 2017 CF Carlos Tocci assigned to Tigres de Aragua. August 17, 2017 CF Carlos Tocci assigned to Lehigh Valley IronPigs from Reading Fightin Phils. April 3, 2017 CF Carlos Tocci assigned to Reading Fightin Phils from Clearwater Threshers. October 4, 2016 OF Carlos Tocci assigned to Tigres de Aragua. September 20, 2015 OF Carlos Tocci assigned to Tigres de Aragua. June 16, 2015 CF Carlos Tocci assigned to Clearwater Threshers from Lakewood BlueClaws. March 30, 2013 CF Carlos Tocci assigned to Lakewood BlueClaws from GCL Phillies. July 21, 2012 Carlos Tocci assigned to GCL Phillies from Lakewood BlueClaws. July 2, 2012 sent OF Carlos Tocci on a rehab assignment to GCL Phillies. June 14, 2012 Carlos Tocci assigned to Lakewood BlueClaws. August 23, 2011 Philadelphia Phillies signed free agent OF Carlos Tocci to a minor league contract.